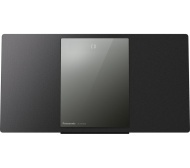 alaTest on kerännyt ja analysoinut 13 arvostelut tuotteelle PANASONIC SC-HC1020EBK Wireless Flat Panel Hi-Fi System - Black. Keskimääräinen antama arvosana tälle tuotteelle on 4.3/5, verrattuna keskimääräiseen arvosanaan 4.1/5 kategoriassa Audiolaitteet. Me analysoimme käyttäjien ja ammattilaisten antamia arvosteluita, tuotteen ikää ja muita seikkoja. Verraten muihin tuotteisiin kategoriassa Audiolaitteet, PANASONIC SC-HC1020EBK Wireless Flat Panel Hi-Fi System - Black on saanut alaScore™-arvosanan 89/100 = Erittäin hyvä. Very simple to use for streaming from Spotify, although be advised that a premium account is necessary. No FM signal in this part of London but DAB operates perfectly with internal aerial provided. Easy to set up favourite internet radio presets using Panasonic app. Very easy to set up and use. Sound is good and looks good. Hadn't realised front part was a mirror, thought it was grey! Feels a bit flimsy when cd cover opens. Not a bad point, as such, but it would be better if the remote was not so large. Felt very light to the degree of cheap. Sound quality is good up to about 60% but struggles after that. From CD tray is a finger print magnet. Few steps missing in quick set up instructions. When compared to other units sound can sound a little muffled. very surprised how good the sound quality is.